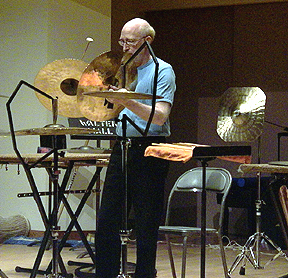 In 1971 there were only two professional percussion ensembles in North America – The Blackearth Percussion Group, started by Garry Kvistad, and the ‘other’ percussion group, founded by Bob Becker, Bill Cahn, Robin Engelman, Russell Hartenberger and John Wyre. Now there is one ensemble that contains the wealth of experience, knowledge and vision of those pioneering virtuosos. With John Wyre’s retirement, NEXUS has welcomed Garry Kvistad on board and completed an historic circle of musical ideas, artistic directions, and percussion repertoire. NEXUS concerts embrace an incredible variety of musical styles, with an approach to programming that has opened doors and shown the way for contemporary percussion ensembles around the globe. They are truly ‘the high priests of the percussion world’ (New York Times). 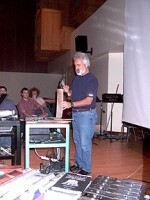 A NEXUS concert is exciting, educational, colorful and, often, just plain fun. The members of NEXUS offer an enormous array of workshops, clinics and masterclasses, covering topics that may be historical (where did the snare drum and its rudiments come from? ), ethnological (how does a West African drum ensemble play together like that? ), practical (exactly how do you play all of those tricky triangle and tambourine parts? ), or even scientific (why are the sounds of percussion instruments so harmonically complex?). 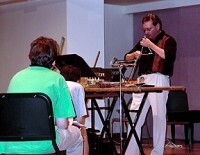 A NEXUS residency can invigorate and revitalize any percussion department. NEXUS has defined the art of modern percussion for over three decades – unique in 1971, there is still nothing else quite like it. 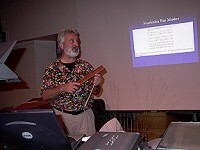 There is only one way to experience the link between past and present, the connections among world percussion traditions. See and hear the real thing – NEXUS! MASTERCLASSES – student performances for audiences of students, colleagues, and the general public. NEXUS offers its experience and expertise to student performers to help them with general concerns (career goals, learning resources, etc.) and specific issues (technique, style, sound, phrasing, etc.). Response to student performances of xylophone and/or marimba repertoire. Individuals or small ensembles perform for NEXUS; NEXUS responds and/or works with student performers to develop ideas and skills. NEXUS’ REPERTOIRE WORKSHOP – NEXUS performs and discusses its repertoire. Topics covered include selection of individual pieces and program planning, performance techniques, working with instruments, aesthetics, and issues related to a professional performance career.